Once again, Paper Made Bakery is so very pleased to have Savannah O'Gwynn as a guest designer for January's Fresh Baked Kit. Remember that we're partnering with Sweet Stamp Shop this month to bring you a versatile and simple clear stamp set filled with wonderfully unique sentiments -- called Sentimental Birds. It's just part of this great kit that also includes Authentique's Blissful 6 x 6 bundle of patterned papers, loads of fun and frilly embellishments and rich cardstock in coordinating and complimentary colors. 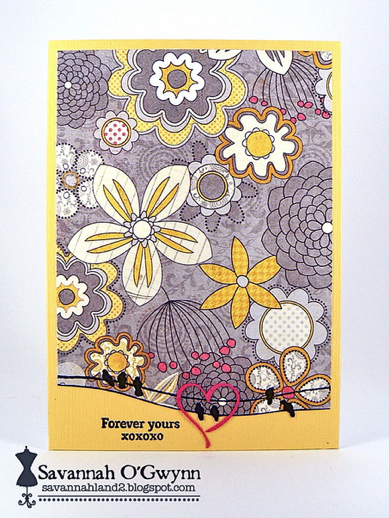 Sav's card, called Forever Yours, clearly illustrates some of the fantastic patterns in the Blissful paper bundle. Look at the surprising *pop* of red among the subtle yellows and grays and how Sav took that and tied in her heart shape near the bottom. I'm thinking "a new twist on Valentine's Day" here!! Leave some love for Sav then head on over to her place for more! I love this! So amazing! Came over from Savannah's blog - love what she did with this!